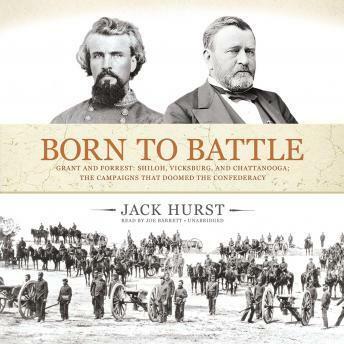 Born to Battle examines the Civil War's complex and decisive western theater through the exploits of its greatest figures: Ulysses S. Grant and Nathan Bedford Forrest. These two opposing giants squared off in some of the most epic campaigns of the war, starting at Shiloh and continuing through Perryville, Vicksburg, Chickamauga, and Chattanooga-battles in which the Union would slowly but surely divide the western Confederacy, setting the stage for the final showdowns of this bloody and protracted conflict. Grant is widely regarded as the man most responsible for winning the war for the Union; Forrest, as the Confederacy's most fearsome defender in the West. Both men had risen through their respective hierarchies thanks to their cunning and military brilliance, and despite their checkered pasts. Grant and Forrest were both lower-born officers who struggled to overcome particular, dubious reputations. In time, each became renowned for his intelligence, resourcefulness, and grit. Beginning with the Union victory at Tennessee's Fort Donelson in February 1862, Hurst follows both men through the campaigns of the next twenty months, showing how this critical period-and these two unequaled leaders-would change the course of the war. An utterly American tale about class and merit and their role in one of the most formative wars in the nation's history, Born to Battle offers an impassioned account of two visionary Civil War leaders and the clashing cultures they fought-in some cases, quite ironically-to protect. Hurst shows how Grant and Forrest brought to the battlefield the fabled virtues of the American working class: ingenuity, hard work, and intense determination. Each man's background contributed to his triumphs on the battlefield, but the open-mindedness of his fellow commanders proved just as important. When the North embraced Grant, it won a stalwart defender. When the South rejected Forrest, by contrast, it sealed its fate.